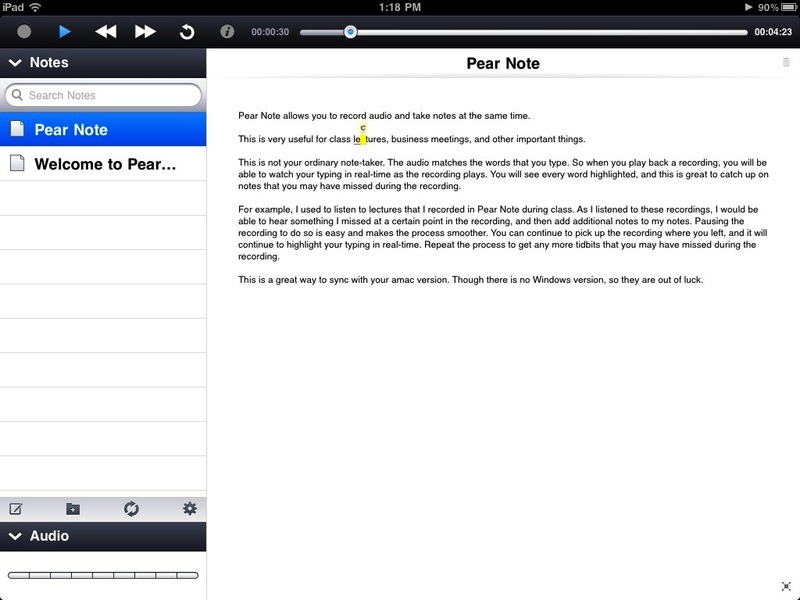 Pear Note ($4.99) by Useful Fruit Software is a note-taking application that links audio recording with what you type. 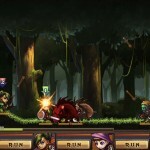 This is also a companion app to the Mac version, though it can be used by itself as well. 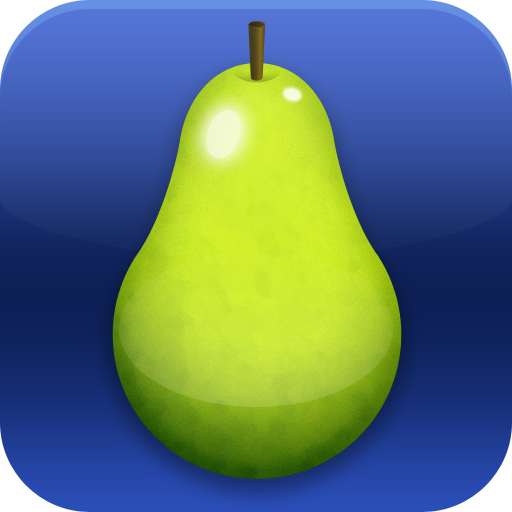 During my time in college, I found Pear Note to be an invaluable tool for lectures. I discovered it while browsing Apple’s site for software downloads (before they moved on to the Mac App Store), and was very glad I did. 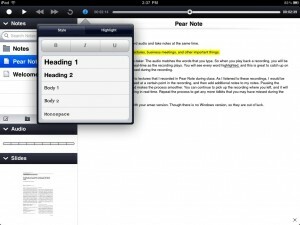 Even though I’m no longer in school, I was extremely pleased to hear that Pear Note was released on the iPad. And it can even sync with the Mac version via Dropbox. 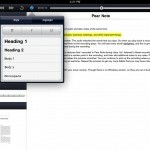 On the iPad, you’ll get a default two-pane view (in both landscape and portrait) – to the left you have the list of notes, and to the right you will see the actual document. You’ll notice four buttons in the Notes section: New Document, New Folder, Sync, and Settings. At the top of both panes is where the audio controls sit. For those that own the Mac app, you will probably be interested in hearing about the sync first. Yes, you will be syncing through Dropbox, but Pear Note on iPad will create a Pear Note folder in your Dropbox to sync to. This means that you won’t be able to access your entire Dropbox folder. Hopefully this can be changed in the future. If you move the files on your computer into the Pear Note folder (which is created the first time you hit the Sync button once Dropbox is linked), they will start showing up immediately in the iPad version. You can select them and view the document, and play back the audio and watch the marker in the text be highlighted in real-time. 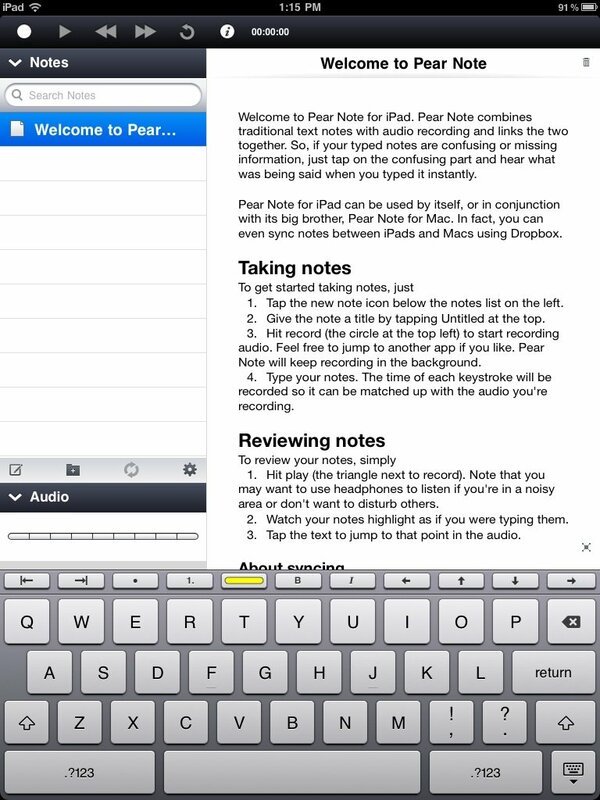 For those that never used Pear Note before, creating a new note is easy. Just tap on the “New” button at the bottom of the Notes section – this will present you with a blank canvas. Tap on the Record button at the top to start recording audio, and just start typing away! The audio indicator at the bottom left will show you how high or low the audio levels are. You can also stop the recording to pause it, then record again to have the app continue where you left off. Pear Note will also show how much time has elapsed in the recording, if you’re worried about that. If you prefer to utilize a full screen mode, tap the little expansion button in the bottom right corner of the editing area – the left panel will disappear (tap the button again to bring it back). The keyboard in Pear Note adds a slim top row to make note-taking easier. There are buttons to increase/decrease indentations, bullet points and numbered lists, highlight (select the text first), bold and italics, as well as moving the cursor around. There is an “i” button that gives you even more options, such as different headers, body paragraph formats, and even monospace. If you prefer to change the highlighting color, you can do that from this little menu as well. As you take notes and record audio, Pear Note will be syncing along the way, so you don’t have to worry about losing your progress. If you are the paranoid type though, you can always ensure that your files are synced by manually tapping on the button. When you come back to your notes for later reference and play back audio, you will see the best feature about Pear Note: your audio and typing is linked together. So this means that when you play it back, Pear Note will highlight your text during playback, so you can see what you were typing at that time. Additionally, you can tap anywhere in your text during playback to automatically jump to that point in time in the recording. Pear Note allows you to search through your notes, which is especially handy if you have plenty to go through. 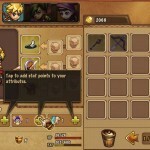 The search will go through the entire note, not just the title, so it’s especially useful. If you sync with the Mac version, you may be familiar with the fact that you can import PDF files into a Pear Note file, which would then show up as Slides. These slides will show up in the bottom left corner of the iPad app, in it’s own section – “Slides.” You can go through them by swiping left or right on the thumbnail, but you can’t view more than that. It would be nice to have a way to view bigger versions of these slides for reference. Due to Apple’s own limitations, there isn’t a way to import PDF files into Pear Note on iPad as Slides either – this can only work from a Mac with Pear Note installed. 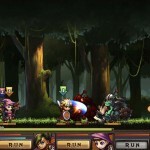 This is quite disappointing, but not the developer’s fault. Maybe someday, this can be changed. Having the ability to export non-stylized text to another app on your device would be good to have as well. 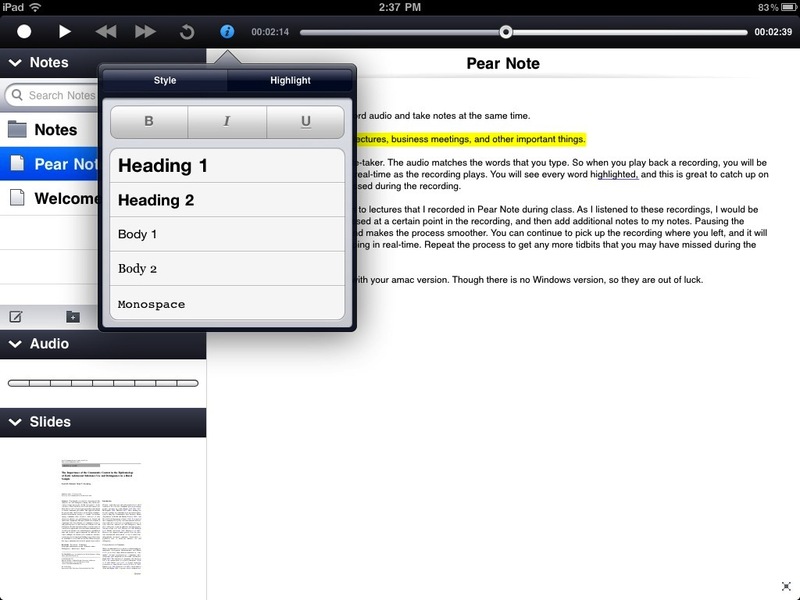 Despite these flaws, Pear Note is still extremely powerful for note-taking. The interface is also clean and intuitive. Hopefully they can allow a better view for slides and the ability to export non-stylized text to other apps in the future. Also – lifting the restricton of the Pear Note folder in Dropbox would also be great. 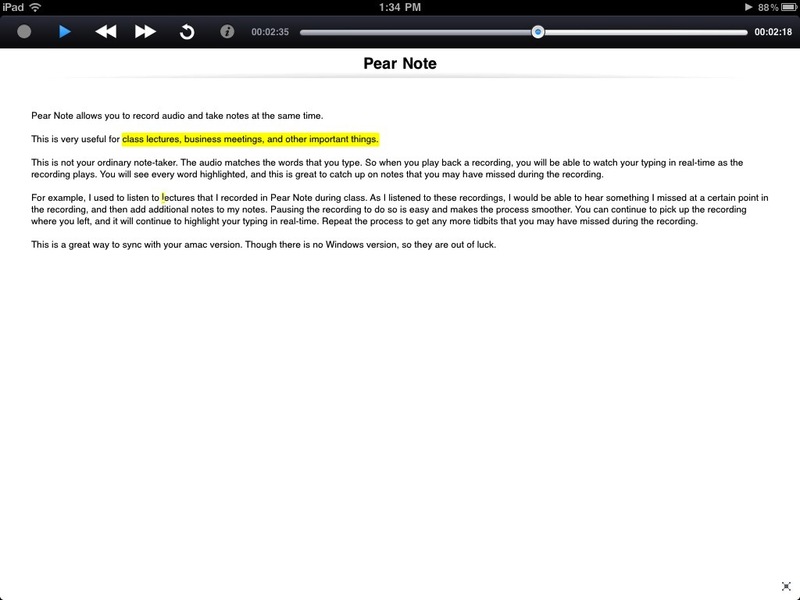 If you’re a student, businessperson, writer, or anyone that needs to take notes while recording, then definitely check out Pear Note (and maybe even the Mac app). 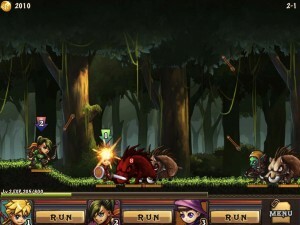 The iPad version is on sale for $4.99 for a limited time, so get it before the price goes up.